I arrived in Puerto Montt yesterday—after nearly 24 hours of bus riding—in the late afternoon winter darkness as wind rattled the metal roof of the station. The first thing my friend who picked me up asked me, as we passed a stoplight that would later be thrown down by the storm, was if I liked to run in the rain. In contrast to the pricy races in the US, this race was free. The first 500 participants even got a t-shirt—and everyone got water and snacks. But as I signed up and later as I ran, I was struck by the universality of race culture: there are the gear-zealots who sport compression-fabric everything, with mazes drawn onto their spandex to tight socks that reach their knees. There’s the blasting American pop music at the start line, and the rush to use the bathrooms. There’s the halting of the mass movement when someone falls, and then quickly scrambles up, while trying to lift a thumb in order to prevent anyone from stopping. There’s the camaraderie and conversations with random strangers (one man even gave me a square of my favorite Chilean chocolate bar, Sahne-nuss). 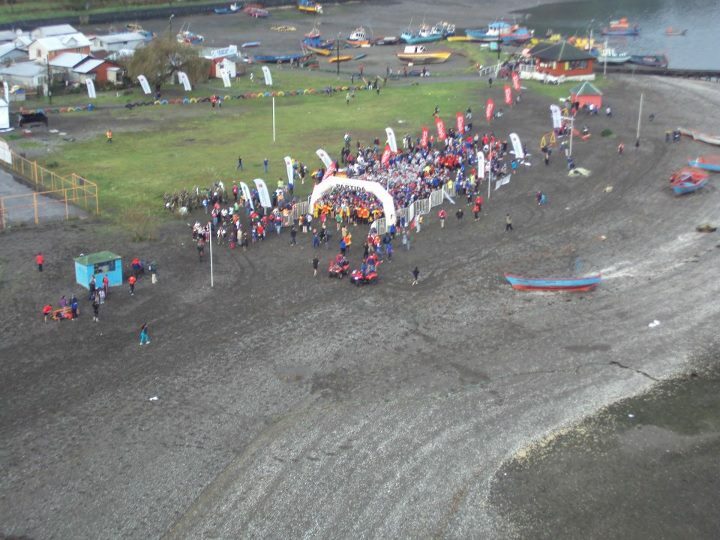 There’s the awkwardness of being cheered on by strangers, who inevitably start yelling when you are too far away and cannot maintain the enthusiasm (only exacerbated by the fact that many spectators were in small skiffs or rowboats along the coast). There are the trail-runner stripes that leave zigzagging lines of caked-on dirt, rock, and blood from the soles of my shoes on the inside of my legs (sloppy form doesn’t improve on sand, it seems). Those things were the same as many races I’ve been in—or at least similar (I’ve rarely had “vamosvamosvamos!” screamed at me at the US). But this race was unique by any standards. To get to the start line, we jumped in Navy boats to cross from the mainland. The beginning crossed a stretch of black sand, followed in large part by long stretches of slippery rocks reflecting, with textured brightness, the pink mist-muted morning light. Some of us didn’t beat the tide in time, and had to wade through patches of ocean to reach land again (encouraged at higher volumes from nearby boaters). 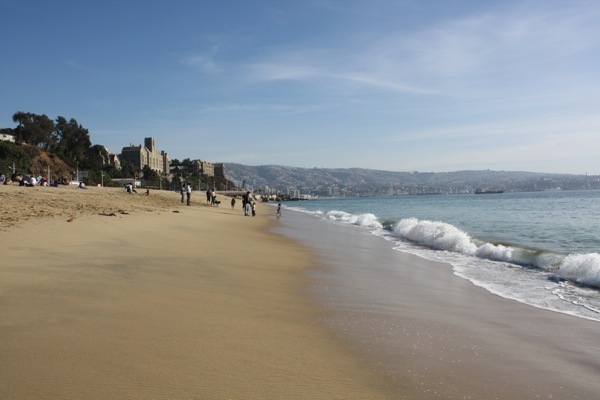 We circumambulated the island, following the rocky and sandy beaches for thirteen kilometers. Since I was running, I unfortunately don’t have pictures, but there are several on this site: http://www.facebook.com/DesafioTenglo. This post isn’t about jetlag. In fact, despite an eleven-hour plane ride, Chile and New Haven are in the same time zone. Yet after adjusting to Chilean time, we might as well be thousands of miles east or west, instead of due south. I approach this topic with serious bias. Early to rise, late to bed, and eating on a meal/snack schedule with almost no standard deviation, I notice the smallest change in la vida cotidiana. So Chile has shocked my system. A day in Chile starts with breakfast—a pretty simple affair with coffee and toast with jam and butter. The student population often skips this meal entirely, usually due to sleeping in after a long night (in the library, of course!). Lunch is not just a meal, but a mid-day break, a cultural halving of the day that requires hours of one’s time spent consuming several delicious courses. Lunch doesn’t really start before 1 PM and goes as late as 3:30 PM. Almost all restaurants have a prix fixe menu with a soup or salad, entrée, dessert, and beverage for several thousand Chilean pesos. Generally it’s a pretty good deal…until you walk to the next restaurant and realize that you were totally ripped off. But hey, we’re boosting the Chilean economy—I guess? Next in the day is onces, an early evening snack, which also happens to be around dinner on Yale time. Once means eleven and is a legacy of British-style teatime, although in Chile this snack is at around 6 PM. This also means that, much to my nerdy dismay, onces are not quite the same as elevensies, though they do enable a hobbit-like meal schedule. Most Chileans eat dinner between 9 and 11 PM, only slightly different from the 5-7:30 range in Yale dining halls. We’ve been eating around 8:30, which means that we’re often the first people to arrive at a place for dinner. That might sound uncomfortable, but when you’re a large, loud group of foreigners, it makes life much easier. As cultural connoisseurs, our nights never simply end with dinner. We’ve come to Chile to understand society, traditions, and the people who live here—no small task. But our efforts are aided by nighttime outings. Bars get busy at around 11 or 11:30 PM, with clubs starting to fill up at 2 AM. Clubs don’t reach maximum numbers until about 3 AM (or so we hear 🙂 ). 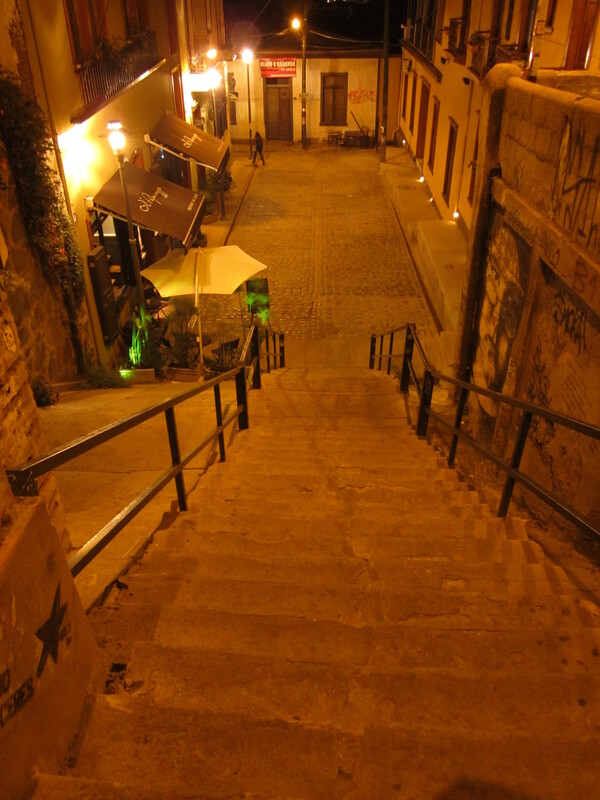 The night ends at 4 or 5 with a palta-smothered completo or churrasco from a food cart as people begin to climb up the steep, winding streets to their homes and hostels, where they rest up to begin the next day (really the same day) with a long, late lunch. 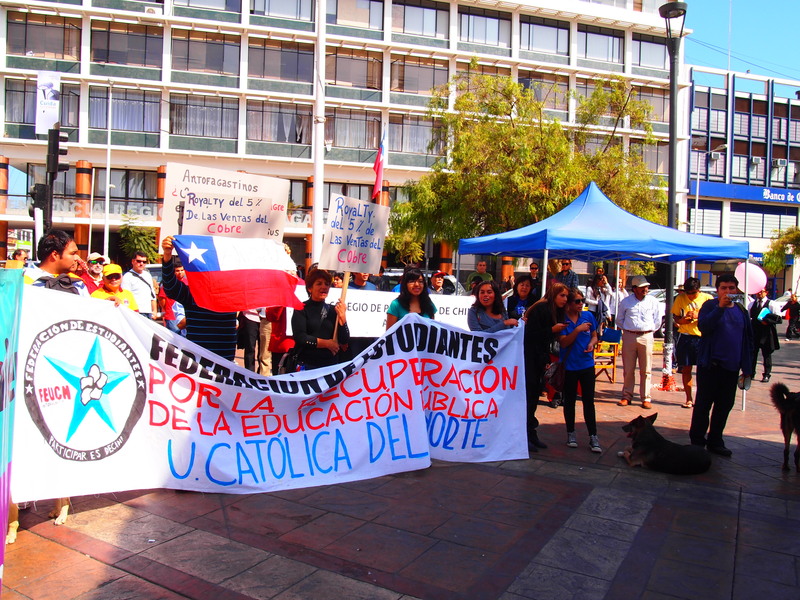 Chilean students need that sleep and a big lunch—otherwise, how would they protest and march on a daily basis? The Universidad Técnica Federico Santa María looks like a castle by the sea. 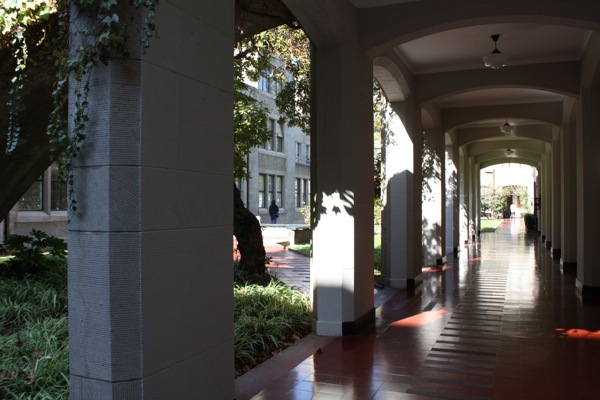 Yale is gorgeous, but it doesn’t exactly have the view of this university, which is also one of the best in Chile. We climbed up dozens of stairs (or hundreds, depending on who in our group you ask), to a view that looked out across the entire bay of Valparaíso. When we got to the top, we realized that we were apparently important. We were greeted by Katie, the International Affairs liaison at the university, who escorted us, much to our surprise, to the house of the rector of the university, Jose Rodriguez. The President’s mansion on Hillhouse may be impressive, but it’s no seaside villa. The house is no longer used as a residence, because in the 1970s, a wave of protests similar to ones sweeping Chile now spurred students to run their own Occupy movement—at the rector’s house. Arriving at the house, we met the rector, a nanotechnology professor, and a physics professor. An intimidating bunch, they were shockingly warm and funny. The rector directed us to a dining room where eleven plates of crab, shrimp, mussels, and ceviche awaited us. Assuming this was our lunch, we annihilated it. The rest of the group, having more manners and social grace, tried to avoid using their forks as shovels. We were pleased, though slightly embarrassed to realize that we still had two equally delicious courses to go. 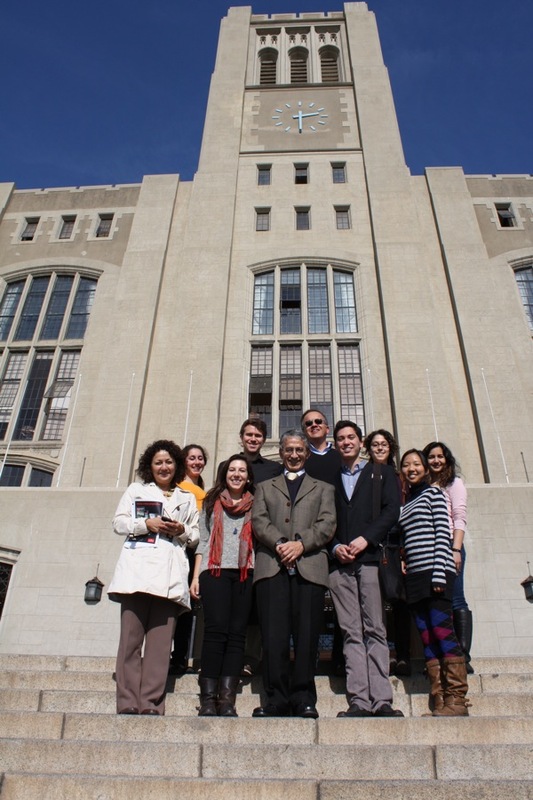 The professors spoke to us about entrepreneurship in Chile and their efforts to connect their enterprising students with investors. The obstacle most aspiring entrepreneurs face is that the Chilean upper classes tend to invest their money in stocks and banks, which are sure to provide returns, instead of the more risky business of start-ups. Over roasted salmon, rice, and sautéed vegetables, we discussed everything from student protests to the rector’s college glory days. After dessert and coffee or tea we posed for pictures with our wonderful hosts. As they presented us with gifts and said their goodbyes, we were still in shock. In fact, we are still not certain they realize we are just your average college students. But then again, who are we to pass up a three course gourmet meal and farewell gifts at a villa? As if that wasn’t perfect enough, we walked off our meal by frolicking in the (frigid) Pacific Ocean and soaking up the sun as we lay on the sand. We’re not sure what we’ll do when we we’re not Yale students anymore and people no longer consider us worth wining and dining. So, this is what economic development looks like. 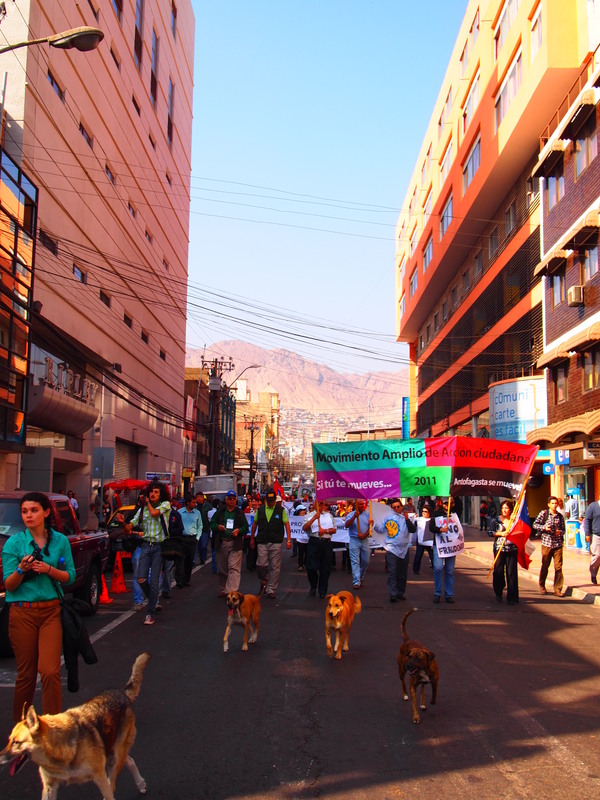 Before arriving in Antofagasta, we all had distinct ideas about what the city would look like. Some of us guessed it would be the Dubai of northern Chile — we’d heard a lot about how it was an expensive, rich city essentially built around the mining industry. Others thought it was a tiny mining town and still pictured soot-faced hefty mine workers to be wandering around in their work gear all day. The answer is it is neither. Antofagasta is one of the main cities in the northern region. There are rich suburbs and some intensely poor ones, and there are a few colleges, both public and private. No actual mines exist in the city, but a few private transnational companies exist outside the city. Antofagasta, then, is a city that exists as a product of the mining industry, but the clearest trace of mining that I’ve seen so far were the advertisements in the airport when we landed, showing off the latest technology and advertising fancy hotels for business trippers. But mining forms the underlying pulse of this entire region, and, in reality, Chile itself. Many of us are researching things to do with labor rights and social movements in the country, and Chile has gained its most international media attention recently because the nation is exploding with protests. 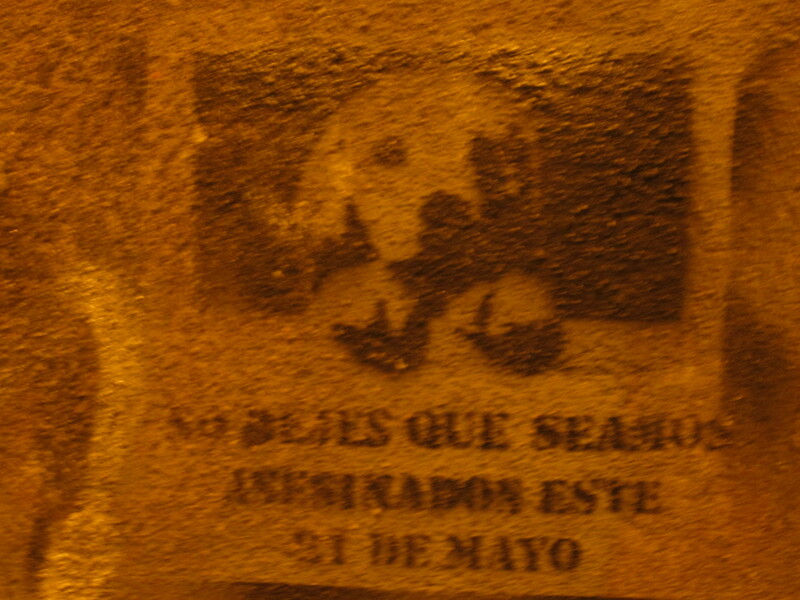 Here, those protests and movements are taking form against the way the government interacts with the mining industry. Today, we encountered our second protest. We met up with protesters at the Plaza del Colon at 10 AM, and as they gathered slowly, putting together their signs and chatting with one another, we were pleased to find a few familiar faces in the crowd — some of the students from Catolica Norte who we met last night were there, as were a few of their professors and even the nanny union-leader who Diego had interviewed yesterday. We saw young people and grandparents, mine workers and students who described themselves as “militant Communists,” and even a few local political leaders. The atmosphere was friendly and calm, and the group, as it marched through the streets, never took up more space than a block. But people are angry. 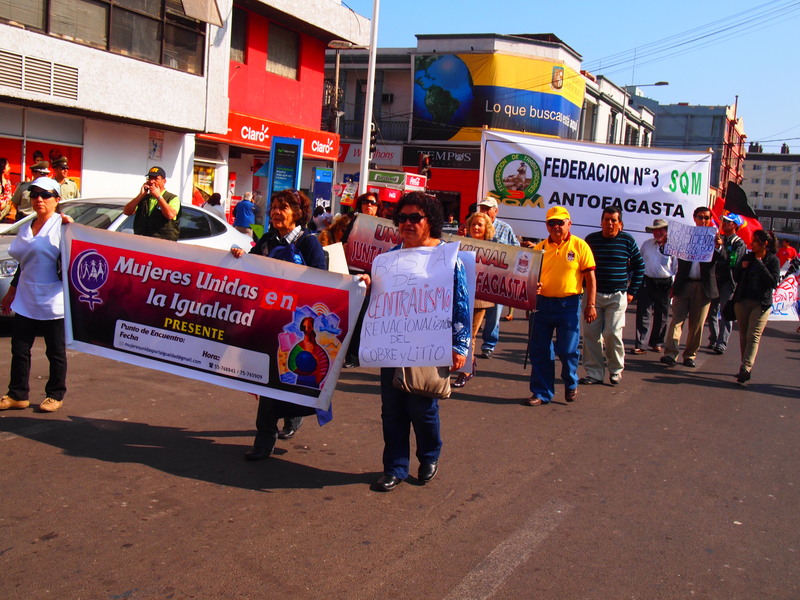 The protest was against FONDENOR, the same thing I posted the press release about earlier. FONDENOR is essentially a government initiative that was initially greeted with great excitement by the country; it purports to take the money gained from taxes on the industry and redistribute it across the northern region so that the local areas benefit from mining. 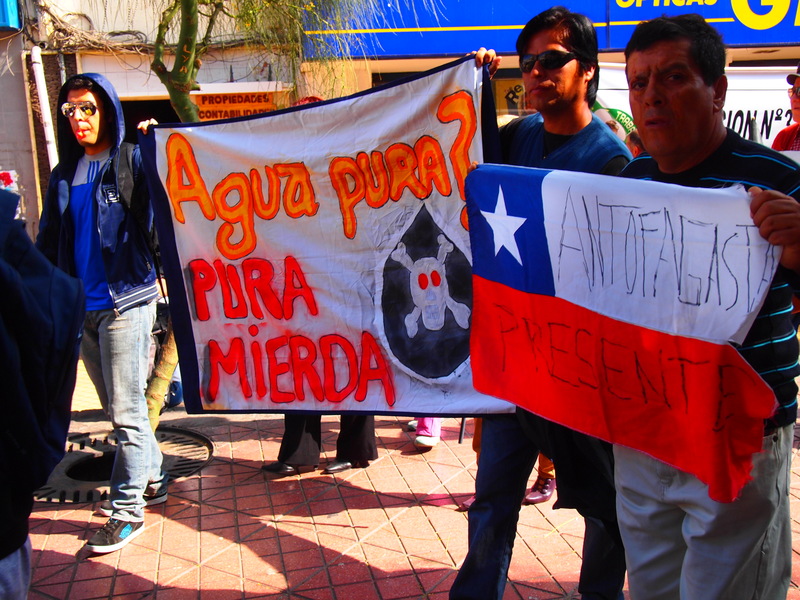 But when the government began to define what constitutes a mining region, towns like Antofagasta and Calama were left out because they don’t have actual mines within their city limits — but they’re where most miners live, and where most of the business surrounding mining occurs. 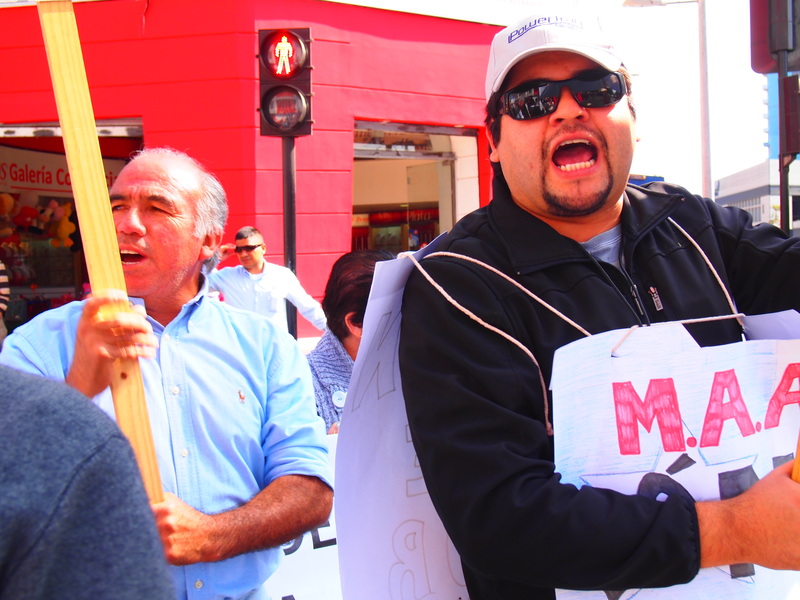 The north is bursting with anger over this: the protest we saw today was tiny compared to what workers in Calama did just yesterday, blocking highways and preventing any through traffic from getting into the city. We’re at the stage of the trip where we’re starting to hear a lot of the same things. For reporters, that’s comforting, because it means we’re on the right track, and we’re starting to “get it.” In Chile, we’ve been seeing signs of a country between development and supremely strong economic status, and the unrest — the students, in the southern part of the country against dams and in the north against mining — all speaks to a country experiencing severe growing pains. The question is whether the cramps will stop the country’s growth or if they will pass and let it keep on growing up. 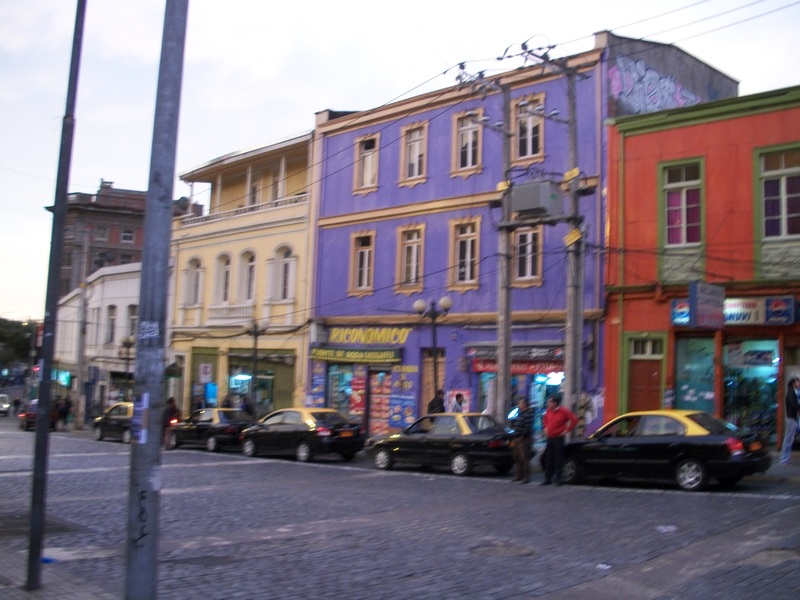 Only an hour and half away from Santiago by bus, Valparaiso is a vibrantly colored city that hugs the pacific coast. 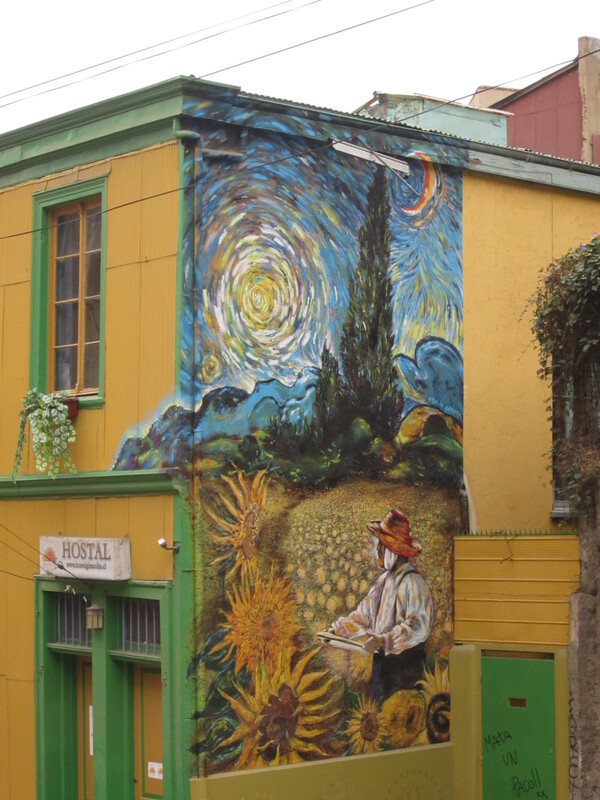 Once described to me as “San Fransisco, but more Boho and Spanish speaking,” the entire city is named a UNESCO world heritage site and the street art ranges from Van Gogh interpretations to puppy stencils. The air here smells more of sea than smog (a wonderful change) and with the salt water so close, the seafood here is going to be competing with avocados for our attention. Walking around the city is not only a great way to discover 600 peso empanadas or hidden views of the ocean, but it is also an intensive form of exercise! After hiking up and down those steep, stair-filled hills at least a couple times a day, there is absolutely no shame (or guilt) in ordering that dessert after dinner AND going out for some gelato. Rest assured, the Valpo group will be in fabulous shape upon return to Santiago after this week! Overall, our first day has been a great start to seeing all the different views this cultural city has to offer and we are so excited to share with you everything we will soon discover in the nooks and crannies of Valparaiso! You’ve been wonderful followers so far! According to our blog stats, we have readers following us from all corners of the world — Costa Rica, Nepal, Albania, Israel, Hong Kong, and more. We hope you keep up with us for another week, as we set out to our secondary trip locations. 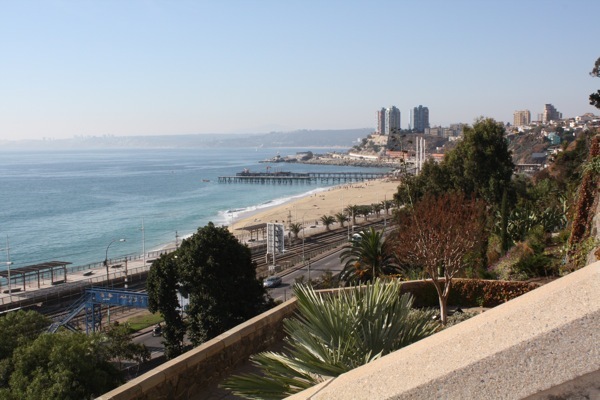 One group is headed to Valparaiso today, which our own Chilean fearless leader Diego Salvatierra ’13 described as, “like San Francisco but a little more bohemian and everyone speaks Spanish.” Naturally, team Valpo is excited to wander through the city, visiting Pablo Neruda’s former homes in the city and in Isla Negra, and to check out plenty more wine and famous Chilean seafood. The other group has just arrived in the north, where they will spend their time hopping across the Atacama desert, from Antofagasta to San Pedro and then to Calama. The north has a landscape unlike anywhere else in the world, and is the home to the mining industry and many indigenous groups — an interesting combination, to say the least. As always, a few Globalistas will continue their travel after these two weeks, and our team will truly cover the entire spine of Chile, continuing our research and maybe relaxing a bit. When the group departs on the 24th for the US, those of us staying behind will be adventuring everywhere from Southern Patagonia to islands along the west coast to the Pisco Valley north of Santiago to adventuring over the Andes mountains and into Argentina. The spirit of Glo travel can’t be contained in just two weeks! Keep following us, dear readers, and please send us your thoughts, dreams, recommendations or vague musings on what we’re up to down here.